Heliotex™ Automatic Solar Panel Cleaning Systems automatically wash and rinse your solar panels. Once the system is installed and programmed, it requires no further attention except the occasional refilling of the soap concentrate and replacement of the water filters. The system can be programmed to wash and rinse as often as you feel necessary for you area. The Heliotex™ system attaches nozzles to your solar panels. Water from an existing source, such as a hose bib on a private residence, creates the water necessary for the system. The system can be attached to an existing hose bib or plumbed in with a copper or plastic line. A 110 AC power supply is required to operate the controller. The Heliotex™ component box contains a five-gallon reservoir for our soap concentrate and the components necessary to supply soap when required and the filter housing. There is also an anti-siphon valve that prevents backwashing into the water supply. The Heliotex™ System can be adapted to any panel array configuration. 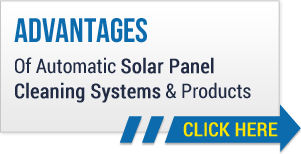 Whether 20 panels or 20,000 panels, the system is scalable to your requirements and allows you to maximize your investment by allowing your solar panels to achieve their potential. Please contact us if we may provide any information to assist you. Your purchase of solar panels represents a significant investment. Allowing solar panels to become dirty due to airborne particles, bird droppings, and tree leaves can greatly diminish your solar power output. In other words, you are not getting the production you paid to get. If solar panels are never cleaned you not only lose a significant amount of power, you also risk losing the panels. While many factors impact solar power production in solar panels, experts agree that you will lose power. That loss may range as high as 25% in some areas according to the National Renewable Energy laboratory. Individual dealers have reported losses as high as 30% for some customers who failed to ever clean their panels. How does the automatic cleaning system work? The Heliotex™ Automatic Solar Panel Cleaning System places spray nozzles at each panel. Our specially formulated soap concentrate is mixed into the line for the wash cycle to clean the panels. There is also a second rinse cycle. Panels are washed approximately every one to two weeks. It is recommended that the panels be rinsed only every two to three days to keep accumulations of dirt and debris from building up on the panels. Will the water from the nozzles damage my panel? The Heliotex™ Automatic Solar Panel Cleaning System uses low volume nozzles that will not damage your solar panels. Our system is not like a pressure washer. Can I install the cleaning system myself? Heliotex™ recommends that only licensed solar panel dealers install our cleaning system. While a knowledgeable individual could easily install the system, one does not want to damage a roof or an existing solar panel array. There is also the concern of injury or liability for someone untrained in solar panel installation. How does the soap work? Heliotex™ soap concentrate is specifically formulated by a chemical company. The concentrate level is calculated for use in water systems to ensure the correct amount of soap is applied to the panels. Each row of panels is washed, one at a time. The soap remains on the panels until all rows are washed. The system then returns to the first row and repeats the cycle, rinsing only. While the rinsing cycles may be done anytime during the day, washing should only occur when sun is not shining directly on the panels. Our automatic controller allows you to set a convenient time during hours of darkness for the washing cycle. Will using the soap damage my solar panels or injure my plants or animals? Our soap concentrate is designed to clean solar panels without any damage to the solar panels, frames, or roofing materials. The concentrate formula is biodegradable, even over time with constant use. Some cleaning products, while biodegradable if used once, may create a toxic build-up if used continually. Use of any other cleaning product voids the warranty on the Heliotex™ system and runs the risk of damage to the solar panels, or injury to animals and plants. What do I need to do to maintain the system after it is installed? The Heliotex™ Automatic Solar Panel Cleaning System is fully automatic. The only thing the owner needs to do after initially programming the controller is to replace the soap concentrate as it is used. The deionized water filter also needs to be replaced approximately every six months. What is the warranty on the Heliotex™ Automatic Solar Panel Cleaning System? All parts on the Heliotex™ system are warranted for one (1) year. How often do I need to add soap or change filters? The Heliotex™ system component box has a five-gallon reservoir for the soap. The amount of soap usage depends on the number of panels in your system and the frequency that the panels are washed. For a standard 50 solar panel residential system you would replace soap and filters approximately once every six months, assuming the system is washed every two weeks.